We’re now offering our clients a better way to interact with one another and with our support experts all in one place. The newly redesigned MC User Connect site is now available to all customers to bring them a faster and more efficient way to stay connected. Customer (John): I logged into MCUC this morning and saw that the site has a new look. Can you tell me more about it? MC Solution Engineer (Adam): MCUC was updated to save you time by providing a faster way to connect with support, search for solutions, and connect with fellow users in a simpler way. You can now submit tickets online that go directly to us, record screencasts to show us how and where you may be having trouble, and make product suggestions that other users can vote on to help us prioritize desired functionality for future upgrades. John: Wow, that’s going to make my job easier when I need to get in touch with you. Can I still get access to MC documentation and event updates on the site? Adam: Of course. As always, the MCUC community will continue to be your source for customer news and updates, user forums, product documentation, and eLearning opportunities. John: Sounds like you’ve thought of it all. I’m looking forward to using the new site. Thanks! Get a preview of what’s new in MCUC by watching a short video. For a limited time, users who log into the new system will also be rewarded with a $5 Starbucks card*! * $5 Starbucks cards are limited to the first 25 users who log into the new MCUC site. Now that MC User Connect has become well established as our source for customer information and interaction, it seems like a good time to highlight the valuable services available. We currently have over 1200 users signed up for MC User Connect with 150+ articles and more than 200 documents, videos, and commentaries. On average, we have 400 unique visits per week and during those visits we have racked up 11,000 forum views and nearly 800 user submitted posts. If you haven’t signed up yet, now is the time to take the plunge! The User Forum, which allows users to directly interact with one another, is an especially valuable feature of MC User Connect! Customers who use the feature find it to be a very supportive way to share information with other users, as well as dialog about the best ways to take advantage of the system’s extensive capabilities. MC Staff also monitor the forum, responding to questions in which they can be of assistance. With 220 topics currently listed, the MC User Connect Forum contains a wealth of knowledge from real-world customer experiences. If you have a question that you would like to pose to the MC User Connect Community, this is the place to do it! Stay tuned for next week’s second post in this series in which we will highlight valuable new content resources available in MC User Connect. Since the launch of MC User Connect at Checkpoint in April, our customers have actively shared ideas and suggestions in the User Forum. Let’s take a look at how customers are using this valuable tool to obtain suggestions for getting the most out of Maintenance Connection. The User Forum is accessible from the MC User Connect toolbar. Recent topics are displayed by default, allowing you to quickly access new topics and messages. Using the dropdown control on the right, you can quickly filter to topics from a particular category, or even those posted by a particular industry or user group. For example, members of the Education Industry group have used the forum to share ideas on how to best handle the inspection and maintenance of dorm rooms at the end of the term. As can be seen, nine messages were posted, sharing ideas on how this task is managed by different universities using MC. In reviewing MC User Connect activity, we can see that the topic on using MC Mobile has been the most popular, with customers sharing their experience using different devices, as well as how they have integrated bar code scanning for part usage. Topics posted range in both complexity and depth. For example, in the Work Order category, you will find a general post looking for a quick method to highlight newly assigned work orders. This is contrasted by more complex dialogs about the impact of deleting requesters and the implications of using the “convert estimated to actuals” preference. Active customer involvement in the User Forum is the key to its success. Hats off to our most active customers: Brian Lillard from Camelot Services (83 posts), Seth Wild from Diamond V Mills (68 posts), and John Lorette of Keene State College (42 posts). And an extra kudo to Seth Wild who has proven himself to be especially helpful, receiving the most “Thank You” acknowledgements from his peers. Stay tuned next week for another post highlighting how to user MC User Connect to obtain valuable information on making the most of your software investment. Maintenance Connection is pleased to announce the launch of MC User Connect, a brand new resource for users who want to be in the know and take part in the ever growing Maintenance Connection Community. 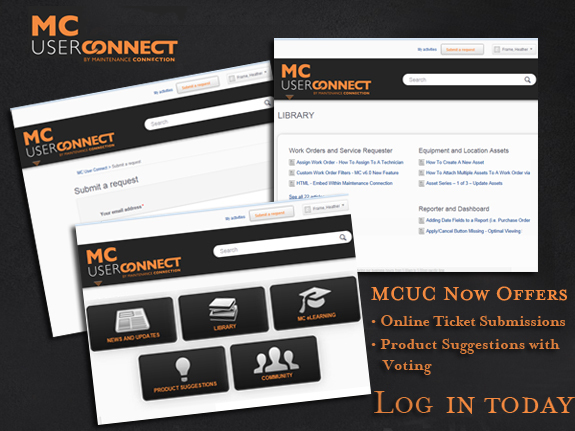 MC User Connect provides a single location where customers looking for assistance or information can find tutorials, documentation, or even post questions in the user forum. We have consolidated valuable resources into a single location to provide you with a one-stop solution to get news and updates, documents, tutorials, knowledgebase articles, and download files. With a full service user forum, expandable topics based on user need, and a commitment to consistent and relevant new content, MC User Connect promises to be a hub of traffic. It is designed to be an ever-growing repository of knowledge available to MC Users all around the globe. How do I sign up and access? To access MC User Connect, simply direct your web browser to http://www.mcuserconnect.com. To create a new account, click on the link to “REGISTER here“…. Once you complete the registration process and then log in, you will have access to over 100 information packed articles to enhance your utilization of Maintenance Connection. With the additional commitment to new content created by both MC Users and Staff, MC User Connect promises to significantly extend the support services available to our customers. Note: This valuable new tool will replace the MC Community, which offers a more limited user forum. In the near-term future, users accessing MC Community will be automatically redirected to MC User Connect. There will also be an option available from the MC Version 6.0 Help Menu to provide access from within the application. Next week, in our second post about MC User Connect, we will review navigation and how to find information you are seeking.